Sometimes, we face storms in our lives and crazy things happen that could either lead you to sink or swim during your storms of life. 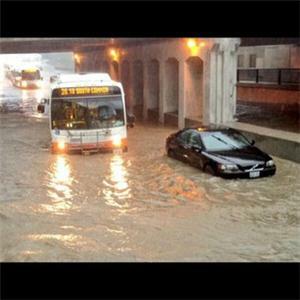 I remember a few years ago, in the Summer of July 2013, my sister and I were caught up in a Flash flood in Toronto due to some heavy and unprecedented rains that Toronto had never seen before. 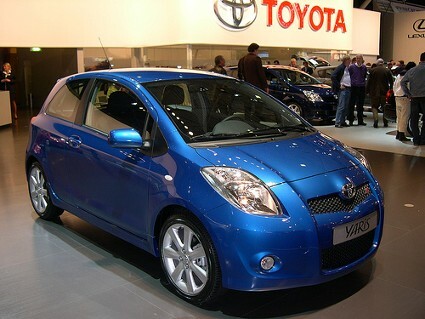 At that time I had a little blue Toyota Yaris as my car and I was the driver. I had been waiting at the station to pick up my twin sister when I noticed that the rain started to become really heavy. By the time my sister arrived at the parking lot to be driven home, the water was already ankle deep. I told her to hurry up and get into the car because I was going to drive us home like my life depended on it. I can tell you that I had had a really bad feeling that if we delayed any further, it was going to be a struggle to get back home. So I started to drive like crazy in the now knee deep waters to get home. I was high on adrenaline because I felt like the Holy Spirit was shouting in my head to not stop and keep going no matter what because now the rain had started to downpour like a crazy freak monsoon storm. My Blue Toyota Yaris looked like this model – The car that weathered the storm. As I was driving I told my sister to start praying because this was gonna be a rough ride home. I had to drive up a hill, down a slope and when I got to an intersection, there was a massive river flowing fast like a monsoon river that you’d wonder if you could even cross it unscathed. I was looking at other drivers and I saw a woman behind me in a big SUV freaking out. I too wanted to freak out but I was already on “Faith Mode” and high on adrenaline that I kept saying “I’m not going to die today!”. My sister was scared if not terrified too, because this was unbelievable! I said to her I’m driving through this river and I’m not stopping because I knew that if I stopped, water would seep into the car and the car would be stalled and then we’d probably drown in the car and our car was a really small one at that. I was on the “I don’t think so!! !” mode. So, I pressed down on the accelerator and just when you thought we would be swept up by the severe current, we miraculously crossed the huge intersection without any problems. Big cars that were behind us saw what I did and I’m pretty sure some of the drivers thought I was crazy to even attempt to cross this tsunami of an intersection, but I did it anyway trusting the voice of the Holy Spirit that was screaming in my head and in my heart. Something told me that if I did this, others would have the courage to follow and their lives would be saved, so I noticed in the rear view mirror that other cars started to follow closely behind me with courage and did the same thing. The terrified woman that I had passed earlier was right behind me following my tail. The water was now window deep, OMG! I prayed to God in the car alongside my sister and asked the Lord to not allow any water to enter or seep into the car or into the engine. Would you believe that throughout the whole ordeal, no water seeped into the car! God is amazing and miraculous! Anyways, continuing on with the story, I was now window deep in murky brown water and I was still high on adrenaline thinking “We shall live and not die!” . 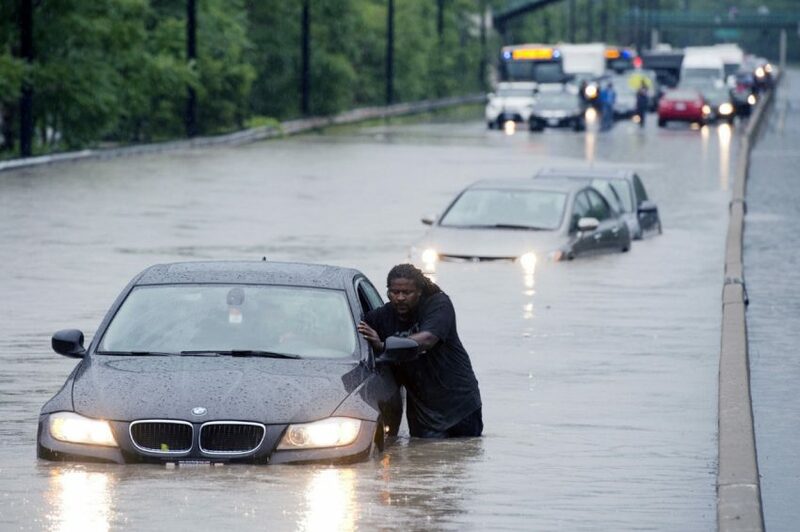 I could not believe that in Canada, we could experience such floods that we typically see in Asian countries or countries that are prone to floods etc. I guess you live through something new everyday! lol. 😀 I kept my foot on the accelerator and though we were now window deep in water, the small frame of my car was starting to bop about up and down drawing us closer to the opposing lane which was dangerous. I turned my steering wheel closer to the curb so that I wouldn’t hit any car and prayed to God to keep me on the straight path. My sister was praying alongside me. The one thing that the Holy Spirit impressed on my heart as I was driving was to not stop and keep going because if we stopped, the car would stall and then we’d be in grave danger of drowning. The Holy Spirit also impressed on my heart that I would lead others to safety if I followed His instructions on how and where to drive. So I was looking at my rear view mirror and I saw the terrified woman in the SUV following close behind me. She noticed that wherever I went, I was still able to keep going. She was following me like her life depended on it. The cars behind her followed suit. I also noticed that the cars that stopped ended up being stuck on the sidewalk and water started to fill up those cars. I remember seeing a woman stuck in her big range rover and she saw my little car pressing through this torrential downpour. She looked terrified and amazed that I could still keep moving despite everything that was going on. We finally made it over the hill and when I got to Mississauga, there was less water on the roads and the flash flood had subsided. My sister and I were greatly relieved. I had hurt my right foot because I had pressed on the accelerator with such force that I had twisted it. I didn’t really care because I was now safe and sound. The cars that had followed me from behind had passed me and some of the drivers had waved at me saying “Thank you” although I don’t think I did anything to warrant that lol. One driver thought I was crazy since I was driving such a small car but was happy that they followed me the whole time because now they were safe as well. I was high on adrenaline and I had never heard the Holy Spirit speak to me so loudly like that before until that day. Mind you, many of the cars that got stuck were huge in size and had more horsepower than my car, but somehow, they were the ones that got stuck and my little Blue Toyota Yaris was the car that prevailed through the storm and led the pack to safety. I feel like through that experience, God showed me that some may trust in their chariots (cars) some may trust in horses (horse power of the cars) by those that remember the name of the Lord, they will prevail. 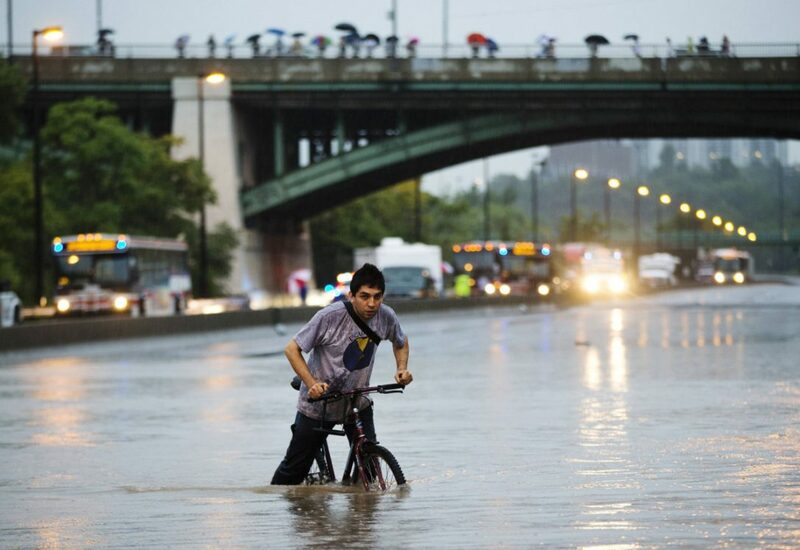 I was totally God-reliant in that situation and my God saved my sister and I from drowning in that crazy flash flood that we experienced some years ago. I always get amazed at God’s saving grace in my “near death” experiences. It just goes to show you that God is the One who Saves especially when you put your 100% trust in Him. He is the way maker. When there seems to be no other way, He is the One that charts the course, He makes a way for you when there seems to be no way. I thought my sister and I would drown in that crazy freak storm, but God showed me through the power of the Holy Spirit to follow His leading and He took me and others that followed me to safety. The power of God is real my friends. Do not underestimate the voice of the Holy Spirit. How do you know when the Holy Spirit is talking to you? That supposed “gut instinct” that you feel at times is most likely the Holy Spirit talking to you. The Holy Spirit has a way of impressing a thought into your subconscious making you feel led to do something that seems right but you just don’t know how to explain it. You just feel led to do it because that is how you move by Faith. ← We Live As Kings – Imagine!